He was evidently keen on the guitar and would have asked Mozzani, who lived in Bologna at the same period (1900-1909). It us very likely that Respighi wrote the guitar piece, not at the request of Mozzani, but as a study to learn about the instrument. He was a master at writing for different instruments and would have asked Mozzani for advice. However, it seems this was not forthcoming, and Respighi may have dropped the matter. Segovia subsequently came to know Respighi, but there is no mention of the piece or any attempt to write something for the maestro which we know of. I think the main problem with the Variazioni is that they are in quite unusual flat keys for the guitar, going from C major, through F, then Bb, G minor, C minor,Ab, Db (eek! )Bb minor. Then he runs out of flat keys and the editor kindly puts us back into C major! So, what are we left with? It is presented as a set of variations which change as the piece progresses; it is also one of the earliest pieces of twentieth century guitar music to have been written by a non guitarist – predating Moreno Torroba’s Danza, often cited as the first modern guitar piece by a non guitarist, by 10 years. So now you know! Get it from from Ricordi via Boosey and Hawkes. You also get a fairly unreadable facsimile at the back so you can make your own edition. 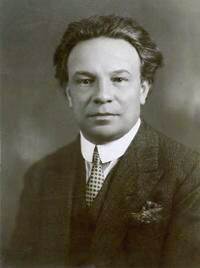 Respighi was an enthusiastic scholar of Italian music of the 16th, 17th and 18th centuries. He published editions of the music of Claudio Monteverdi and Antonio Vivaldi, and Benedetto Marcello. His work in this area influenced his later compositions and led to a number of works based on early music, such as his three suites of Ancient Airs and Dances. Although Respighi didn’t write any other pieces for the guitar as such, his lovely orchestrations of pieces by Galilei and Roncalli seem to have the air of a giant guitar about them, much as Manuel de Falla’s pieces often have. I am in the middle of arranging one of the suites for guitar orchestra, but it will never have the richness of the original orchestration. There is also Respighi’s Feste Romane, which contains a mandolin solo in thr third movement, so he was conversant with plucked instruments. He also travelled to Brazil with his lively wife Elsa, and made friends with the physicist, Enrico Fermi on the boat back to Europe. The piece which resulted from this trip was a three movement work, Impressioni brasiliane, full of colour and infectious rhythms. Here is a video of Bruno Giuffredi playing the variations. As Giuffredi comments, it is very likely that these are not variations at all, but preludes or short etudes. Here is one of the Ancient Airs and Dances – is this Sanz? (Matanya Ophee has correctly pointed out the the source of this piece as Da Un Codice del Cinquecento by Oscar Chelesotti – it is No.64 in the collection, with an undecipherable title – in fact,it appears that this book was the source for many pieces in Respighi’s three suites) followed by Roncalli’s Passacaglia, probably made famous by being included in this suite. Thought you might like to see JW with an interesting hairstyle playing the same piece in this rare footage. Nice one John! This entry was posted in Guitar, Music, Thoughts and tagged Ancient Airs and Dances, Bruno Giuffredi, Gilardinao, John Williams, Mozzani, Respighi, Roncalli by Gerald. Bookmark the permalink.